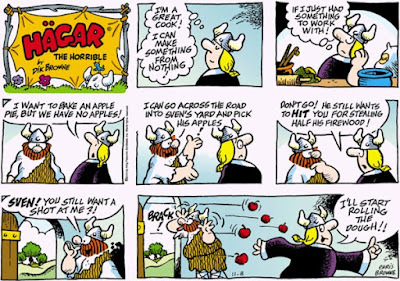 This isn't exactly how it happened, but I have been using a lot of apples lately, and they have come off my neighbors' tree, so it made me laugh. Our neighbors have an apple tree, but they don't want to bother with the apples, so they just let them fall. The local wildlife really appreciates it. They (the neighbors, not the wildlife) say we can have any apples we want. I picked a few, but most of them are out of my reach. Our neighbor has a handy apple picker he's let me use in the past, but this year he never got it out of the shed, and I never caught him outside or thought about it when I saw him, so I didn't have it to use. However, in the past few weeks we've had some windy weather that knocked several of those apples onto the ground, so I went over and picked a bunch of them up while they were fairly easy to tell from the ones that had been on the ground for a while and while they were still in pretty good shape. I've been making apple desserts and applesauce and drying lots of apples, too. If you've got any other good ideas for apples, please let me know, because I still have quite a few apples left.